Keyboard Maestro makes it incredibly easy to do all sorts of things to selections, including text transformations, thanks to its Filter Variable action. This action has a ton of choices; click the image at right to see them all. Because it acts on a variable, all the macro needs to do is capture text to a variable, transform it, then write it back out, replacing the original text. Erase a variable—textToManipulate—to insure it starts empty. 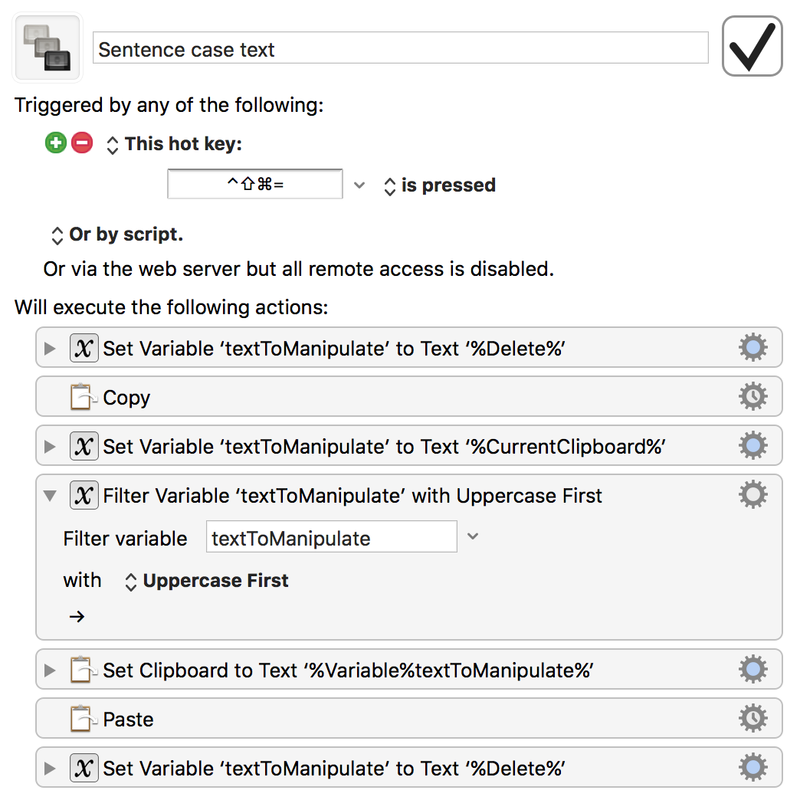 Set the textToManipulate variable to the contents of the clipboard. Apply the Uppercase First action, which capitalizes only the first letter of the text. Set the clipboard to the now-transformed text string. Paste the text, replacing the original (as it was selected already). Erase the textToManipulate variable when done. Assign this to a keyboard shortcut, and it will work anywhere you can select text. But really, that’s not the best solution in this case, because now you need to use two tools—the macro and the Transformations menu—to manipulate text. Instead, you can use Keyboard Maestro’s Conflict Palette to create the pop-up menu of transformations (and a non-transformation) shown above. lc – Lowercase the entire string. lC F – Lowercase only the first letter, leaving the rest unchanged. 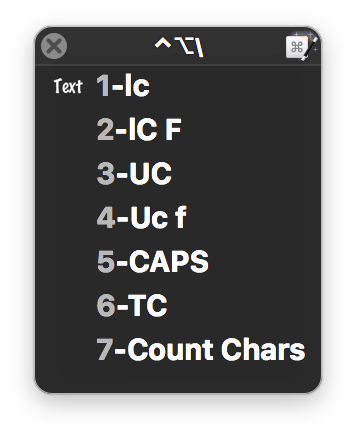 UC – Uppercase the entire string. Uc f – Upper case the first letter, i.e. sentence case. 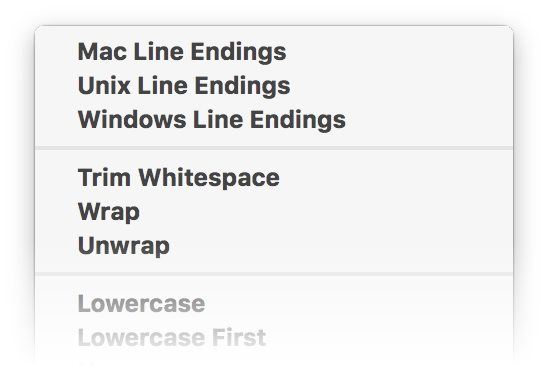 CAPS – Uppercase the entire string. TC – Capitalize the first letter of every word, i.e. title case. Count Chars – Pops up a huge window showing the character count of the string. Each of the first six macros is identical to the Sentence Case macro, but with a different transformation` chosen in the Filter Variable action. The last macro, Count Chars, is similar, but instead of replacing the selection, it just displays a huge window with the character count of the selection. Download the macro to see each step in detail, and to customize it for your needs. As a reminder, the Conflict Palette appears automatically when two or more macros have the same shortcut. In the download version, each step is assigned Control-Option-Backslash. When that shortcut is pressed, the conflict palette appears. You don’t have to use a keyboard shortcut, however. You could make the macro only available in Keyboard Maestro’s menu item, for instance. I’ve also named each macro with a number, which serves two purposes: It controls the order in which items appear in the palette, and it lets me activate each by pressing the associated number. And, of course, you’re not restricted to what I’ve shown here; there are a ton of options in the Filter Variable action to apply all sorts of transformations. More Keyboard Maestro greatness. This is better than the KM setup I had been using. Thank you. 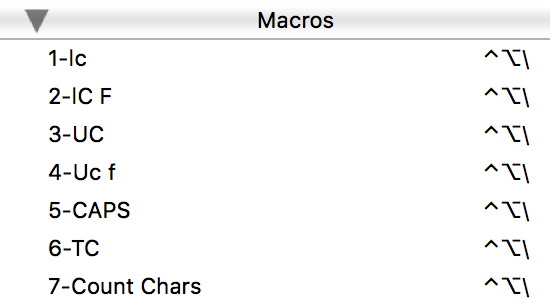 I made one addition to each macro, and I’m pointing it out in case it’s of use to anyone else: I added an action at the end of each macro to Delete Past Clipboard (that’s clipboard #0) since that’s not something I want to persist there. Good addition; I always forget to do that.